The mission of SAS Savvy is to improve SAS® programming skills with best practices techniques, best resources and mentoring. 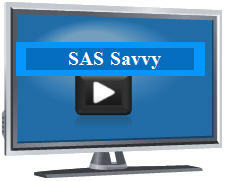 See SAS Savvy presentation. The strategy behind focused online SAS® resource and SAS® training is to empower SAS® Savvy Members with a 'Personal Productivity Platform'. 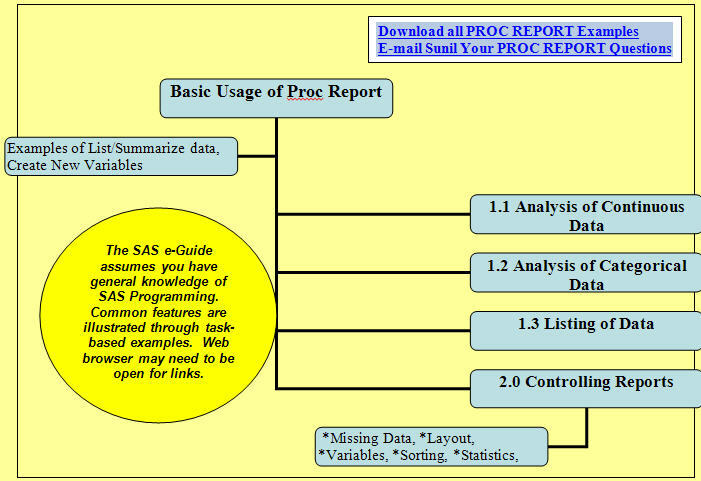 From the three main categories in SAS® Savvy, SAS® Procedure Info, SAS Topic Info and SAS Savvy Resources, SAS® programmers have immediate access to the full scope of both the best SAS papers to explain each concept as well as a central repository for common SAS® Programming FAQ to leverage their SAS® programming experience. The key is in organizing a massive amount of technical information for maximum impact. New to SAS® Programming, see roadmap to SAS Savvy for navigation instructions. I look forward to hearing from you on how I can enhance your website experience. SAS® Savvy is the first SAS® Blog membership subscription based solution for your ongoing SAS programming challenges. I take the best SAS® resources on common and analytical SAS® Procedures and SAS® topics on the internet and centralize, standardize and catalog the websites and information to make it easier to find and apply. You can think of SAS® Savvy as your personal on-line assistant. 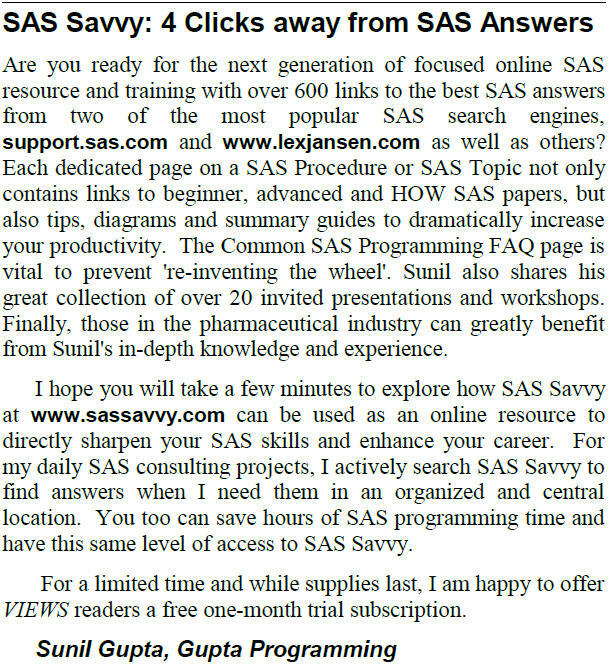 To see how SAS® Savvy can impact your productivity, I invite you to view the one page example flyer and the Four Clicks Away to SAS Answers and Introduction to SAS Savvy Webinar video recording. Have you ever wasted time with SAS® programming challenges or felt isolated with no one to turn to for mentoring or real-time support? Have you been searching for a program to fill your growing need for focused SAS® answers and a forum to share SAS® knowledge? 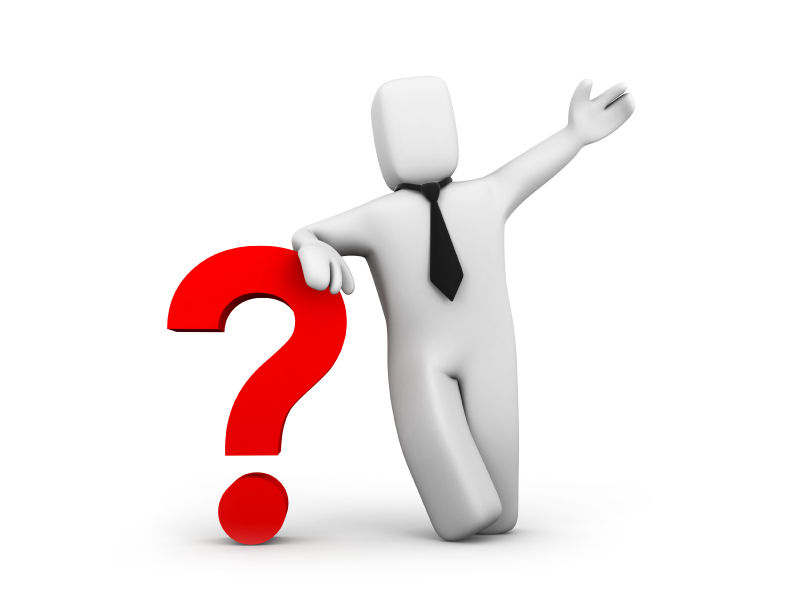 From Proc SQL to SAS® Macros, each month, I will explore these important SAS® topics to answer your questions. See the SAS Training Topics for a full schedule of topics. I hope you will take a few minutes to explore how SAS® Savvy can be used as an online resource to directly sharpen your SAS® skills and enhance your career. For my daily SAS® consulting projects, I actively search SAS® Savvy to find answers when I need them in an organized and central location. You too can save hours of SAS programming time and have this same level of access to SAS® Savvy. See what the critics are saying about SAS® Savvy and my SAS® training materials. Join now by choosing between two membership levels: SAS® Savvy Basic or SAS® Savvy Premium. View the video below for a brief tour of SAS® Savvy, examples of SAS® Savvy membership-only access to top SAS® papers, tips and more along with Birds of a Feather for membership descriptions. Not sure why I am qualified to mentor you in SAS® programming? With over 18 years of hands-on SAS® programming and training experience, I can help you advance to the next level with practical tips that will save you hours of SAS® programming time. 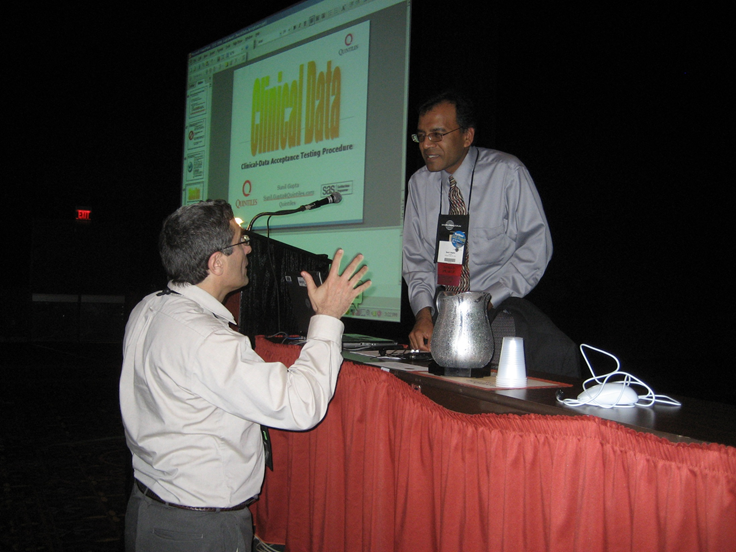 Visit Contact Sunil for more information about my SAS® training experience and pharmaceutical industry knowledge.